"First time at Rustler Lodge after coming to Alta/Snowbird for over 30 years and wonder why I never came here before. Everything about it was great from the service, room, food, pool, convenience, etc. We stayed in a king room in the newer wing with... "
"I just returned from my 4th annual "guys ski trip" to Alta and the Rustler Lodge and our affection for the place and the people there keeps on growing. The personal service says it all: on the first day of our first visit four years... "
"Rustler is A Healthy Addiction"
"Alta is an incredible ski mountain, with "the greatest snow on earth," and Rustler makes for an absolute DREAM trip. It has become an annual addiction for me and several friends (early 50's) - the dopamine release starts with just thinking about returning the next... "
"Annual Retreat with Vertical Smile"
"We are a group of professionals, mainly dentists, that have returned to the Rustler for 26 successive years. The lodge is wonderful, with great amenities, an amazing staff, ski in, ski out at Alta. Likely the best ski area in the US for pure skiing... "
"We, a family with 4 children ( 3,5,14,14), had a wonderful time during a weeklong skiing / spring break trip. The lodge is extremely well run. Very kid friendly. Our daughter loved the kids table at night. Skiing is true ski in /ski out... "
"Brings tears to the eyes"
"We have been to The Rustler at least six weeks (plus lunch at the restaurant back in the 1990's when we couldn't afford to stay here). The wonderful staff seems to have been consistent for two decades. Like a dream, we finally were able to... "
"Everything you could possibly want in a ski lodge"
"We have just completed our 4th stay (of 11 fabulous days) at Alta's Rustler lodge. That in itself is high recommendation. It is indeed our 'home away from home' in the US as that is exactly how you are made to feel as soon as... "
"Friendly, attentive, staff. Delicious meals. Very comfortable relaxed lodge. Everyone in our 3 generation (12person) family felt the Rustler is the best!! We have stayed there many times and will keep returning... "
"The Rustler Lodge is the premier place to stay in Alta. Between the well-appointed rooms, the inviting bar & dining areas, the luxurious spa area, the top-notch food and the engaging staff, I dare say one cannot find a more superlative ski lodge experience ... "
"Tremendous week of skiing and relaxation at the Rustler Lodge"
"My wife and I had a super ski week at the Rustler lodge. We had been to Alta before and had stayed in an on mountain condo. This time around, we wanted to really unplug and relax and the Rustler fit the bill perfectly... "
"Best place to be non weight bearing after knee ski injury"
"Room 802. Great room, great view. I injured my knee first day of trip and the entire staff was so helpful in seeing to my needs. Ski shop canted my boots with care after my accident. Unfortunately will have to wait until next year to... "
"First Time Guest - Wonderful Stay and Why"
"I has a wonderful first stay at the Rustler with friends and relatives. I have stay d in a huge variety of places over forty years and know what really makes a lodge work for me. First and foremost, the people who works there are... "
"Best ski lodge in USA because of the staff and location!" "We just completed our 9th Presidents flay weekend father son ski trip at Rustler Lodge in Alta. The Managment (Tom and Kate Pollard) have always hired very well and the entire staff makes you feel like family. The service and food are top notch... "
"Modern amenities in a classic ski lodge at the base of Alta Ski Area"
"The Rustler does skiing right. You can ski to and from either base location at Alta Ski Area. Breakfast and dinner are included with lodging. There are a wide range of rooms, from dormitories to suites... "
"We stayed at Rustler lodge in room 506 The staff were very welcoming on arrival and the room on level 5 was handy as it was close to the restaurant, bar, lounge and ski hire and lockers The location was also great... "
"Ill be honest, I was a little hesitant to book this hotel given the steep prices here. Based on the pictures I saw online, I couldn't see what justified the high cost of the rooms. But I'm so glad I decided to stay at Alta's Rustler Lodge. From the service to the food to the amenities, all exceeded my expectations... "
"One of the most beautiful settings for a world class ski vacation or spending a summer vacation in the Utah's Mountains." "And skiing is spectacular either at Alta or the next door Snow Bird resorts.What a lovely setting facing the Alta Ski Resort and sitting right at the edge of the Road leading up to the Mountain, sitting at an elevation of 8000+ft! It is one of the greatest venue... "
"How many Five Star Reviews can you have? As many as you deserve. Lots of places rent rooms, very few do it as well as the Rustler. It's the staff they are the best. Smile on their face song in their heart, Love this place! See you in Feb... "
"Four years ago, I wrote a review stating emphatically something I had known for years: The Rustler is unquestionably the best lodging experience to be had in Little Cottonwood Canyon... "
"The absolute best proactive, thoughtful, service oriented staff on the planet. Also being located at the base of the best skiing mountain on the planet helps. Our flight was delayed slightly and we were barely going to miss dinner. I got a call from the front desk person saying they noticed... "
"Best Ski Lodge for families and friends in USA"
"There is no place like The Rustler. The location is at base of one of the most dependable powder havens in the USA. It's Rooms are very comfortable and very well appointed. The meals and ambiance of the dining room are wonderful... "
"Excellent pampered stay at Alta!" "We were blown away by the quality of accommodations that are provided at the Rustler. The staff is extremely friendly and helpful. The food is outstanding, and the lodge has every luxury you could think of enjoying... "
"Very well-staffed, fine dining, and pleasant gentle environment"
"We have stayed in almost every lodge at Alta. In each we have appreciated the different 'feel' to each. What is obvious at Rustler is how much help is on hand. It appears that the staff is very well connected to each other and they are happy to working at Rustler. The food is excellent, there is plenty of it, snacks, cider, apres ski in and out of the bar... "
"To stay here for Alta is the best you can get there and you will be very happy. Not only is it ski in and out but breakfast and dinner are included and.......not only is the food delicious with an awesome breakfast but the service is up there with any 5 star place I have stayed. The rooms may not be as nice as a Four Seasons but the service and food are right up there with them!! Rooms are better than han I expected and nicely appointed and very clean... "
"There is no finer place "to stay to ski"... than at this extraordinary hotel in Alta. Year after year they outperform my expectations. The staff are exceptional and the atmosphere & facility are superb. If you are a serious skier looking to combine the best Western skiing with first class lodging experience....this is it. Nothing else comes close. Our annual group is large and difficult to manage...but these folks do it flawlessly year after year... "
"Rustler offers every possible amenity in the friendliest possible environment. A pool, spa program, excellent meals - including the only sit-down "real" lunch on the mountain distinguishes Rustler from the rest. Friendly and family owned-operated, this is the gem of ALL western skiing... "
"Everything perfect. Food, service--both 5 *. Charming bar/lounge with central fireplace.. Indoor and outdoor hot tubs,outdoor pool, sauna, eucalyptus steam room, beautiful views, ski in-ski-out. PP Staff super friendly & professional. Breakfast buffet excellent (can also order from table.) Dinners on a par with top notch restaurants. We had room in Cecret section which did involve a curious route to restaurant but had a great view--and at a lower tariff than other mountain view rooms... "
"All agree, this is the best place to stay when you want to ski Alta/Snowbird"
"The rooms are nice and the location is perfect for skiing at Alta or Snowbird. The fitness room is good and the hot tub, spa and sauna are nice. The Powder House offers great service in providing ski rentals and goggles, etc Most importantly, the people who work at the Lodge make this the very best place. The Rustler Lodge Restaurant food is incredible... "
"Everything a REAL Ski Lodge should be!" "Leave your furs and diamonds at home - this is skiers paradise not Aspen or Deer Valley. If you are comfortable with who you are, have no need to impress, and just want to have a great week skiing while enjoying the best high end laid back ski lodge in Alta this place is for you. Families, large groups - men & women, couples, singles all return to this best kept secret year after year, generation after generation. The slope side view is spectacular, rooms/beds exceptionally comfortable, gourmet food incredible, spa heavenly and the pool along with the indoor/outdoor hot tubs are the best there is... "
"I stayed in Alta many moons ago -- in 1982 -- with my own parents as a teenager, though not at the Rustler. But I never, ever forgot the skiing, the powder snow, and the old-school vibe, which in my opinion is unparalleled in American skiing... "
"Best ski lodge - every detail taken care of"
"Outstanding 5 night stay! Top notch staff and facilities! Waitstaff, front desk, shuttle drivers, managers - all were incredibly friendly, hardworking people who want you to enjoy yourself and have the best vacation possible... "
"We've stayed at the Rustler over President's Day week end for the past several years. The experience is always incomparable. Every staff member you interact with is helpful and genuinely friendly. Most guests appear to be families that have been visiting for many years (or decades)... "
"Fell in love with the Rustler, we'll be back..."
"This was our first trip to the Rustler, and within minutes of arriving we knew it would not be our last. After three days, we totally understand why so many of the Rustler guests come back year after year. From the incredible location, to the super friendly staff, to the gourmet breakfast and dinner, to the pool and hot tub - the Rustler is a special place... "
"The Rustler advertised as having the best lunch on the mountain and this is true. I really enjoyed taking the dedicated chair lift right to the doors of the Rustler Lodge. I has a laid-back vibe in a rustic atmosphere. Loved the facilities they had to drop off your gear in order to eat lunch... "
"The skiing is great, but the Rustler experience is even better." "This was my third visit in as many years, and I look forward to it all year long. The convenience and location makes it so you are skiing just ten steps after you walk out of the building. The entire staff make you feel like part of the family and go above and beyond to facilitate all aspects of your visit.The rooms are nice and the wi fi is free... "
"Why everyone loves The Rustler"
"We have been skiing in Little Cottonwood Canyon for 49 years and started staying at the Rustler after we sold our condo--maybe 20 years ago. Staying at the Rustler is like staying with the perfect family. They demand nothing of you except that you enjoy yourself, and so do everything possible to make that happen... "
"Luxury that truly makes you feel at home for Individuals, Families, Couples"
"We make our best effort to get to Alta and especially Alta's Rustler Lodge each year. There is a reason why so many reserve their room for the following year upon departure. Utah in general is our preferred destination because of the close proximity of all ski mountains to the airport, the friendlier altitude, and most of all the infamous Utah snow that seldom fails to disappoint vs. other states... "
"Everything is perfectly comfortable but also non-pretentious. You'll see people hanging out in robes and going to dinner in slippers. I don't bring outdoor shoes because the only time I'm outside is in ski boots. The pool and spa are excellent, the food is top-notch, and the rooms are comfortable. And, of course, Alta is the best ski mountain in the world... "
"My son and I spent 4 nights at Rustler lodge. The service is second to none. I bought skis at a Salt Lake City ski shop over the phone and one of their employees actually drove to the city to pick them up for me! Food was great, in house ski rentals, lift tickets linked to room bill, great spa/pool facilities...too much to list. 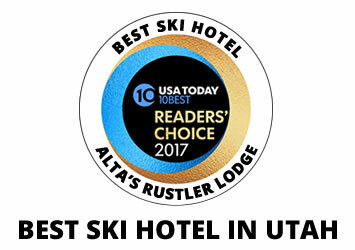 Alta is unparalleled and Rustler lodging is a GREAT place to stay... "
" What a ski lodge should be "
" Rustler cannot be beat for mountain access, attention to detail, caring staff and generally the best accommodations in the area. Having the ski shop with rentals right in the lodge is a real plus. It feels like a ski lodge, catering to the on and off needs of skiers. We come back every year and are always delighted with our stay ..."
" This is the place to stay at Alta/Snowbird! I came by myself a day early before meeting up with my husband and friends. Staff here is super friendly and so helpful. Front desk staff suggested a group style dinner they have here every night; got to meet some great people from all over. The rooms, food, cocktail hour, lounges, views, pool, spa, fireplaces, all the best ..."
" Great Family Ski Vacation!! " " This was our 5th straight year coming to Rustler Lodge and we had another great ski vacation. The accommodations are high quality, the meals are excellent and the access to the mountain is superb! We rent high quality gear right in the hotel and ski-in, ski-out. The pool and hot tubs are great for Apres ski. We are already picking our dates for our next visit ..."
" Rustler Lodge is the most unique play to stay at top tier ski resort we have found. Warm and friendly staff make the Rustler our favorite spot but the amazing food, location, ambiance and overall facilities are also top notch. Can't say enough nice things about this special place ..."
" Always Over the Top "
" This is simply the best ski hotel in North America. It is run by people who are serious skiers, with a philosophy that embraces and emphasizes the skiing itself. It doesn't hurt that they have Alta at their doorstep, of course...but what really makes the Rustler special is the talented committed, veteran, long tenured management in every department. Somehow they also consistently find & hire absolutely first class seasonal staff to make the whole operation flow. Friendly, efficient, attentive. Cannot be topped ..."
" Unpretentious and genuinely friendly for those who come to ski. " " I spent the 3 days before coming to Alta at Deer Valley. Make no mistake, Deer Valley is great. But so is Alta, especially the Rustler. In contrast to DV (with scripted "my pleasure" at every turn), the staff seem genuinely friendly and helpful. Warning- if you need luxury rooms, these are not. They are, however, perfectly functional with good beds (better than Alta Peruvian) ..."
" Best food, accommodations and staff eagerness to serve "
" Staying at the Rustler Lodge the past few days was one of our most enjoyable trips ever. The food was wonderful, as was the room, especially the extremely comfortable bed. Particularly outstanding was the staff's eagerness to make our stay as fine as possible. My wife caught a cold that kept her in on our last day. The head of the dining room overheard our conversation and offered, then brought her a thermos of ginger tea that Helen said gave her surprisingly good relief. We give the Rustler hour highest recommendation ..."
" There's a good reason skiers keep coming back "
" It's because the Rustler is just about the perfect ski lodge. I've read about the people who have been coming here for 20, ever 50 years and I'll be one of them. I've only stayed here three times (this is my second review of the Rustler) my wife and I will continue to stay here as long as we able to ski. The service is second to none ..."
" Greatest Lodge in the Greatest Snow on Earth "
" We've been coming to Alta's Rustler Lodge for 10 years now.......every January and every March, every year; each time that we arrive, it's like coming home. The Rustler staff, from dining to ski shop to housekeeping to desk staff to shuttle staff, spa staff,....goes all out to make our stay fun, worry-free and memorable ..."
" Went on a boys trip. If you like skiing, this is the place. The staff go out of their way to make you you enjoy yourself. We were there during the NCAA National Championship game, and they served us dinner at our request in the rec room in front of the game - nice job Rebecca!Above and beyond. The skiing is ski in/out - you take a little private lift to the base of lifts in either direction from a rope pull. Really convenient from anywhere on the mountain. Alta in general has no night-life, but the Rustler has a nice bar for Apre Ski. Great place - stay here if you come to Alta ..."
" Ski In/Out Nirvana "
" The Rustler Lodge has it all -- ski in/out, great food, ski store and accommodating service. I had a fantastic time at this well located lodge on wonderful Alta mountain. They accommodated me with late check out so I could use my room after my last day of skiing. Also, something went wrong with one of my boots (I brought my own boots). They were able to fix them and make them comfortable again. Will definitely return ..."
" Terrific ski vacation "
" Superb room, space, views - got a mountain view room that was spacious and beautiful - nice décor. The program is breakfast and dinner daily, food was delicious and varied each day. Went with my husband and son and had a wonderful stay ..."
" Comfortable beds and with a superior corner suite, more than enough room for four people. Plenty of luggage and drying space in the room and bathroom is huge (though a bit cold as there wasn't any door to close off shower space). Fill up the included humidifiers, as it makes sleeping much better. Can't remember much in the way of noise from anywhere aside from the groomers early in the morning ..."
" We have been staying at the Rustler for about 50 years. They have always provided for our needs with initiative and in the family style. Great skiing with easy access, great food, great accommodations, and most of all the culture is one of a skiing family in a ski lodge. Dine at the Wasatch Table and meet new friends and see old ones ..."
" Like Alta itself, it is hard to beat the Rustler Lodge. Friendly and unpretentious they seem to have a thorough understanding of how to run and maintain a genuine alpine lodge. The restaurant, lobby and bar have all their 60s-70s vintage charm while the the spa, pool, steam room, etc. have seen impressive remodeling so over the years ..."
" The five guys and the hedgehog "
" Couldn't be better in any sense of the word. The food, lodging, staff service were excellent. Great variety in the restaurant. Special requests were given highest priority. The meeting rooms provided plenty of privacy ..."
" The thing I loved most about this resort was how convenient it was! It truly was a "ski-in/ski-out" resort. The most convenient I have ever seen. They picked us up from the airport, so we didn't need to rent a car. They had ski rental at the resort as well, a family size locker to hold your skis at the end of each day, and you literally just put your skis on and ski down a slope, grab a tow rope and BAM! you are at the first chair lift ..."
" I've been coming to the Rustler Lodge since I was a kid... I'm almost 60 now. The place has grown, but the service and hospitality have stayed OUTSTANDING for all these decades. 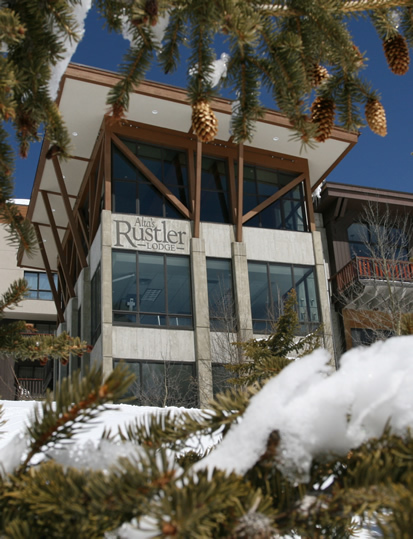 I don't often write reviews, but the folks at the Rustler deserve some recognition for making my ski vacations nothing short of phenomenal over the years ..."
" Best ski lodge anywhere "
" This was my 6th stay at the Rustler for a ski weekend with my daughter. Great for, great ambience and ultimate convenience. Pool and hot tubs wonderful as are spa services. Most rooms have great view. Kids are prevalent ..."
" Old school feel with luxury thrown in! The food is great, coffee is great, the people were so accommodating, and it's so beautiful there. I want to go back. The short trip from the airport is another bonus ..."
" Our family favorite! Been going for over 30 years.Highly recommend! " " We love everything about Rustler Lodge. The owners and staff attention to every detail, dietary request and other preferences is quite special. The location is outstanding. True ski in and ski out. Love the rooms, the spa, heated pools, the dining( breakfast and lunch included), the bar with the most outstanding view of Alta including High Rustler and Eagles Nest, on site ski shop and each room has a ski locker on the lower level ..."
" World Class Service "
" We stayed as part of a large group, and I found it to be nothing short of fantastic service. The rooms were clean and sophisticated, and well maintained ..."
" Is there such a thing as a "casual tuxedo"? The Rustler was just that, the staff, the views, the food, the location, and did I mention the views. It was just the venue to reconnect with old friends as we hunkered down and reawakened how we were connected in the first place ..."
" Outstanding Service and Location "
" I would highly recommend the Rustler Lodge. The location, service and food were absolutely beyond expectations. We went near the end of the season and found great snow conditions. I especially enjoyed the outdoor heated pool overlooking the mountain ..."
" Rustler Lodge Rules! " " Spent an extended weekend at Alta's Rustler Lodge. The level of service and the spectacular location make this lodge the perfect place to enjoy everything Alta and Snowbird have to offer. The skiing was fantastic and the apres ski environment of the Rustler is so great - casual and relaxing. The food is off the charts as well - we will be back ..."
" Couples, Families, ....it's all good "
" On approaching the hotel for the first time, keep in mind you are entering from the back of the property. The classic old school lodge look at first alarmed us to a kitschy formula, but the front desk and manager on duty were first rate and put us at rest ..."
"We're first time visitors at Alta Lodge and we loved it! It's a real mid century modern jewel with wonderful ambiance, great service, and perfect location. The included meals are convenient, breakfast is great, dinner is good. We loved the view from our room and the apres ski lounge with tea and cake. The ski lockers make it easy to... "
"This is a very laid back lodge. It is a great ski out lodge with fantastic views. The spa is solid and we had a great time in the heated pool. The food in the restaurant is excellent and the staff is attentive. Amazing breakfasts and dinner included. This is a great place! " "Alta, and Rustler specifically, is the antidote to Deer Valley's splendiferousness. Rustler sits on the only Avalanche-proof spot in Little Cottonwood Canyon - a little promontory with its own short chair lift, almost equidistant between both of Alta's bases: Albion and Wildcat - perfect. Dinner is included in the room rate because, well, there aren't a lot of other options.... "
"My wife and I surprised our kids with a week long ski trip to Alta, UT. We stayed at the Rustler Lodge and can't imagine a more perfect stay. The Rustler staff were incredibly helpful, attentive and personable. We drove our rental car into the covered garage, handed the keys to a staff member and our bags were waiting in... "
"Please don't come because I always want them to have room for me"
"My husband and I have come here for years. It is a ski in- ski out lodge on the best slopes anywhere. Almost always have great snow. The price of the room includes an anything you want for breakfast and a fabulous 4 course dinner every night with many chioices. The staff is great. Tom, the owner, is always around... "
"The Rustler Lodge remains the top shelf, exceptionally managed operation that we have cherished over the last 30+ years. Year in and year out their ability to deliver an extraordinary lodging, dining and skiing experience remains superb. We invade them with a large group that surely poses serious challenges to them, but they flawlessly execute our visit with a remarkably... "
"We visited the Rustler with a group of friends from throughout the US for 3 days of great skiing at Alta. The place is perfect...a bit retro, a bit rustic, great food, friendly staff. We'll definitely be back. " "This place is staffed with some of the most attentive people you'll find anywhere Both breakfast and dinner included your stay and the food is abundant and very well-prepared Everybody is very friendly and overall it makes the skiing experience that much better You can't beat the location Essentially ski in ski out hotel with all you can eat excellent... "
"This really is the place to stay if you want decent accommodation, peace and quiet and a friendly helpful host. Our group of ladies has met here several times a year for our scrap booking retreat and the owner has been so friendly and accommodating. It's a couple of years since I was last able to join the group but... "
"The experience at the Rustler begins long before arrival. After reserving on line, you are promptly contacted by e-mail to confirm all the details. Shortly before your arrival date they contact you again to orient you to the lodge and help plan your stay. We called the spa before arrival to schedule treatments from a wonderful menu of services and... "
"7 high maintenance spoiled rotten old guys committed to fantastic skiing meet at the Rustler almost every year and we all agree that the accommodations, the unbelievably attentive, professional staff and the fabulous food make this lodge worthy of the best reviews imaginable. Book it. You won't be sorry. " "The 'grooming' at the Rustler is like perfect powder on a corduroy base. It's flawless. The food isn't 'ski area great' it's truly GREAT. Full stop. The facilities are perfectly attuned to the clientele and of course the location is beyond compare. But you could have all this and still not put it together right. What cements the experience here... "
"I have stayed at a couple of locations at Alta. I love Alta! Best snow and skiing EVER! We stayed at the Rustler this past trip and we LOVED it! Food is amazing, bar area comfy and beautiful with great views, staff extremely friendly, and rooms were clean and comfortable. I am already planning my next trip. " "The best place to stay in Little Cottenwood Canyon"
"The Rustler Lodge is a quant, cozy, upscale facility. Awesome service, accomidations and location. Management, front desk, banquet service staff and John at the bar were all exceptional. They take great care of our group of 12 each year. The food is gourmet. The outdoor heated pool, Jacuzzi, steam room, sauna and spa is an after ski highlight. The management... "
"We have been coming to Utah every year for over 20 years with a large group of guys (10-14). We have tried most of the ski resorts and many different places to stay and nothing compares to the Alta mountain for great skiing and The Rustler for first class accommodations. You absolutely can not beat The Rustler for convenience, true... "
"The best lodge at Alta." "I stayed at all of the lodges at Alta and like the Rustler the best. They are very accommodating with our large group of 18-24 guys. The food is great. The rooms are fine. The pre-dinner snacks and bar work out well. The outdoor hot tub and pool are the best. The whole staff is friendly and helpful. It's definitely... "
"Doesn't get much better than this"
"I just got back from an amazing stay at Alta, and booking at Rustler's Lodge was just as important to the experience as the snow. Not only does it manage to pull off a cozy feel, but the service is top-notch, both from the hotel (concierge, housekeeping) and the restaurant waitstaff. I was particularly impressed by the quality (and quantity!)... " "Everything you could want in a ski lodge"
"If you are looking for a very comfortable and convenient place to spend a few days or a week skiing, this place has it all. Very nice rooms -- not luxurious as you'd expect at a Four Seasons or Rosewood, but very nicely thought out with lots of nice touches: plenty of storage, comfortable bed, spacious, and they even provide... "
"Another Incredible Stay @ The Rustler"
"I cannot say enough great things about our most recent stay at the Rustler. Everything exceeded expectations: from the attentive and professional staff, the fantastic skiing, perhaps the most comfortable bed I've ever slept in (felt like 6,000+ thread count sheets! ), delicious and bountiful food, and super relaxing setting. We will be back again...and again! Keep up the great work! " "Second year in a row and my stay at the Rustler was perfect! Wonderful to return and see the many friendly and very attentive 'can-do' staff. I enjoyed three gourmet meals a day – all very delicious with new items each day. The room was super comfortable and spacious with a terrific view of the mountain. I highly recommend the... "
"While the hotel has the basic look and feel of a ski lodge, it boasts all the amenities of a high end resort. I loved the ski-in/ski-out aspect of the lodge, as well as the delicious food which they were happy to adjust to accommodate my gluten-free allergy.What stood out to me the most was the excellent service. Everyone who... "
"Utah! This is the place..."
"This place is one of my favorites now in Utah. Their location is awesome and they have great customer service. This is really excellent for skiing and family winter vacation. Rooms are very comfortable to go with family. Is next to snow bird you can walk and spend all day at the snow mountain having fun. I want to go... "
"It's all about customer service!" "Yes, this is an older property. It has an interesting layout, since newer portions of the lodge and older are joined together, but I can't wait to go back! First, the Customer Service is exlempary. Anything at all that you need, the staff will do their best to accomodate you. This was a girl ski trip - just a great... "
"OUTSTANDING lodge; great for families; perfect ski in/ski out cozy lodge!" "Great five star resort: ski in-ski out homey resort, perfectly located on the Alta mountain. Staff is incredibly helpful, kind and service oriented. Meals are sensational. Your stay includes breakfast and dinner and it is a fantastic place for a family trip! Our kids love coming back and we hope to return for spring skiing for years to come! " "A perfect complete ski vacation experience"
"By far the nicest lodge in Alta. It has the whole package: great views from everywhere, fantastic bar and dining room (real wood fireplaces), great, attentive staff, many differently configured rooms, all the amenities you could wish for, free shuttles around Alta and Snowbird,and,, oh yes, the food is great. You will appreciate the short chair lift to the lodge...."
"We stayed for three days in Alta in early April '15. My husband and kids skied while I relaxed and had spa treatments. The views were beautiful. The food was great. The spa was lovely. I would definitely go back. We had a suite of rooms 810-811, with a door open between them. The only slight negative there is that..."
"Great ski in/ski out inn"
"My daughter and i had a wonderful time at Alta with the Rustler as our hotel. Dinner and breakfast were included in the room rate and we found the food great (she is a vegetarian and they accommodated her with many off menu entrees even though there were always some vegetarian options on the menu) and I always found more..."
"The Rustler is by far the nicest of the lodges at Alta. the service, food, accommodations and amenities are wonderful. This is an excellent place for a romantic getaway or family trip. The skiing is the best in Utsh." "Stayed in Rustler March 2015. Very convenient location where you can ski right onto the lifts. The hotel also has a lift that takes you right to the ski room at the end of the day. Perfect for those looking for a ski-in, ski-out option. There is a shuttle right from the airport at Salt Lake City. Hotel is family-run,..."
"We went back for more in February (and last year too, though I didn't review it then) and nothing has changed--which is great news. We again were at our breakfast table before they were officially open and my husband had multiple extra courses at every dinner. We love the addition last year of the outdoor hot tub though it could...."
"Hospitality without Boundaries – Revisited"
"This was our second season visiting the Rustler Lodge, and we went not once, or twice, but three times because the mountain and the lodge offer a unique sanctuary where one can get away from it all, but, still be connected if they want to. Your visit will start with seamless reservations, taken by Tauni or Kate, and when you..."
"this is my second winter spending a week at the Rustler, and it was even nicer this year thatn last, primarily because my roommate and I had a much nicer room. We were in a unit right on the floor with the lobby, which had a couple of queen beds. Last year, we were on one of the lower levels...."
"Comfortable and relaxed, great food and bar, friendly and responsive staff, ski repair/rental shop on premises, and Alta at the front door. Hard to beat! I highly recommend the Rustler Lodge as a ski destination." "Alta's Rustler Lodge: The Total Ski Package"
"I have been going to Alta for decades and the Rustler just gets better each year. We go to ski, not to be seen. No furs, no baloney, just great ski in/ski out with excellent food and service. Oh, did I mention the spa? Great masseuses, best steam west of NYC, gorgeous outdoor pool, and a 'How may I help..."
"These guys are the best. Great location, delicious breakfast and dinner included, comfortable renovated rooms. We stay here with our large group and they are always friendly and responsive. I VERY HIGHLY recommend this place.."
"There is no way to top the experience and service...."
"You cannot imagine a more relaxing environment for a long SuperBowl weekend. Of course, the Alta skiing is fantastic, but the staff at the Rustler make it a perfect relaxing and fun weekend. The Snow Weasels have been coming to the Rustler for many years. I have been coming for 7 years along with my son and now we cannot...."
"The Rustler Lodge was the best hospitality experience of my life. The staff treated me like their best friend, the (complimentary!) food was exceptional, the service was lighting fast and friendly, and the amenities covered all the bases, and I mean all of them. I am an audio engineer so I'm very careful ..."
"I stayed there a week with a group of skiers, and had a ball. The food was excellent and the service outstanding. I also loved the commone areas-- livng room, bar and spa. The spa had all you could want, including massage services. Ski-in, ski-out." "When we drove up to the lodge the outside was not very impressive (especially after driving the Cliff Lodge). Once we walked in I had a different perspective. The lodge is a full service hotel. The staff bent over backwards to make our stay special. From Kathy the manager to the Toby the bar tender everyone was extremely friendly and..."
"Been coming here for years and it only gets better.... If you like great food friendly service and great accommodations with ski in and ski out at the best mountain in the lower 48 (arguably the best anywhere), come stay here. The Rustler is the bomb. I am coming back again and again." "Without question: this is the best managed ski resort hotel in the country. Our group of 20+ returning guests was handled with grace and expert attention from the moment we walked through the door. The incredible dining and elegant slope side accommodations at the Rustler are simply without peer." "Hard to beat this combination - Alta and The Rustler. Very comfortable with excellent amenities and accomodating, friendly staff. Some of the best bacon you'll ever have! A wonderful Groundhog Day tradition for, hopefully, many years to come." "Alta and its lift-connected neighbor, Snowbird, are well known among the ski world cognoscenti as premier ski areas with incomparable snow, world class terrain, and an emphasis on the skiing experience first and foremost. And within the Alta/Snowbird complex, Alta's Rustler Lodge ranks first in combining the wonderful atmosphere of a traditional ski lodge with modern creature comforts and a..."
"The Rustler is a great ski lodge in a perfect location. Ski in/ski out onto the incomparable slopes of Alta. The lodge has all the necessities you would want for a ski vacation; clean, comfortablee rooms, a large and pleasant dining room, cozy bar, well run spa, geat pool and hot tubs, sauna, steam room, and a great exercise facility..."
"I just returned from my second stay at Alta's Rustler Lodge and I know that I will keep returning. It is a true ski-in ski-out hotel that is a wonderful place to stay. The rooms are spacious (by ski-resort standards), well-appointed, and very clean. Maid service is excellent, and the food was quite good (breakfast and dinner is included in..."
"Excellent food - dinners and breakfasts are included and I was very pleasantly surprised by the quality and choice of selections. Staff was very sincere and helpful; they were genuinely friendly - when I went off to bed after reading in the bar John asked me if I wanted a glass of water. Many of the employees - and guests..."
"The Rustler was the perfect get away for my husband and me. Would also have been fabulous if we brought our children. Staff could not have been nicer, ambiance fantastic, ski in and out so convenient. Really a terrific place in all regards. Can't wait to return." "I've been here two times, planning to go again this year and the next three! The lodge is so comfortable and homey, it makes you feel like you're in the coziest cabin. The rooms are so nice, no matter how big or small, they have the softest beds and the warmest couches. The amenities like the heated pool and the..."
"Simply an amazing experience- have stayed at three other facilities in the canyon and none compare to the Rustler Lodge. A ski in ski out lodge that provides great breakfasts and dinners, included in your stay, ski lockers and a full service ski shop. An indoor exercise facility accompanied by an out door pool, and indoor and out door jacuzzi...."
"This past trip was my first time to the Rustler and after staying at a few other locations in Little Cottonwood Canyon, I will be returning to the Rustler. The food was great with an incredible breakfast buffet and kitchen. It made for a great start to a day of skiing. The dinner menu was great as well." "Have skied Alta and stayed at the Rustler almost annually since 1977. The accommodations are excellent, the staff experienced,friendly and helpful, and the meals exceptional. A true ski out/in experience with lockers at the exit door. Outdoor pool with the view of High Rustler after a day on the mountain second to none. This is truly a skiers paradise." "I rode the chairlift at Alta freezing my toes and thought, "Even if I weren't having a great time skiing new packed powder at -7, I'd have a wonderful time in Alta because staying at the Rustler is fabulous." The mix of new and long time staff provide a warm and welcoming experience. The location at the base of Alta..."
"I went here recently with clients, and had fantastic service. Nice clear rooms, great restaurant. The recently upgraded TV's and internet worked very well. Very nice staff as well." "The Rustler Lodge is simply the best. A welcoming, helpful and friendly staff, outstanding food and skiing/snow/powder that is awesome. Breakfast and dinner are included in the price- so are fantastic apres' ski hor'devours and unbelievable views of the mountain. The outdoor pool is appropriately heated with a steam room, hot tub sauna and world class spa and exercise room..."
"I can't tell you how many times I've stayed at The Rustler but I can tell you that you will not find a better ski resort anywhere! Yoga classes before breakfast, unbelievable high-quality breakfast, Jacuzzi, pool, bar, and then a five star dinner with more choices than you will find anywhere... Need I say more! When you find the same..."
"We just spent 4 memorable days at the Rustler and loved every minute of it. We've been coming for years and are never disappointed. The staff is incredibly helpful and thinks about everything. They saved the day in re-routing us down to the airport after an avalanche down in the canyon. The facility is really nice in an understated way..."
"Simply put, we loved the Rustler Lodge. It was just perfect for us. Here are the reasons why: 1. Reservations were a cinch. In fact, in all of our interactions with the staff of the Rustler we found them to be friendly, efficient, and helpful. As one example (of many), we pre-shipped boxes of our ski equipment to the hotel..."
"We just got back from a 4 night stay at the Rustler. Our first since the kids were born. It was great, and just a quick 45 minute trip from the airport to the end of the Canyon. While there were adult-only havens (the beautiful bar), our kids were made to feel really welcome...even when they were ready to eat..."
"what a great stay. the rustler staff is friendly and accmodating. food is outstanding. I hope they continue this level of service as I will continue to go back." "It's hard to beat the combination of Alta + the Rustler lodge. Easy access by shuttle from the airport, consistently excellent snow and terrain at the front door, plus spa, great food, and great service at the end of the day. Both comfortable and refreshingly unpretentious. " "There is no better perch to ski from-when and where you wish at Alta. Top notch food and service and amenities." "From a quick hot tub in the morning, followed by a much needed stretching class .... on to delicious breakfast .... and ski out the door to one of the best ski mountains in the country, the Rustler is the place to stay. Great service, and always with a smile. I wouldn't stay anywhere else. " "Even with no new snow, our trip was amazing because of the place we stayed. The Rustler Lodge has the best food, amenities and covenience you will ever see on the side of a mountain. And the mountain is pretty cool too! 5 stars, two thumbs up, 5 mics, 10 out of 10 dentists agree, a high-five, however you want... "
"I consider the Rustler Lodge one of the greatest places to stay in the world. Whatever level of attention you want, they deliver. The staff is attentive. The services provided are unparalleled. The food is fantastic, I don't know how they're able to cook that well at that altitude.When skiing at the greatest place in the world I encourage you to stay at the greatest lodge in the world."